Part of this year’s sabbatical goals were to create an SBG curriculum so that I could possibly implement it into my shiny new next-year-job. So far, I’ve just made a list of chemistry topics for the year. I’m not yet sure if it’s better to be more or less specific as far as content goes, so I’m erring on the more side. I’ll also need to figure out how to combine these into larger units (i.e., fewer unit, non-chapter, tests), as well as the non-curriculum-specific skills I want students to have. I’m working off of TEACHING|CHEMISTRY and Always Formative and Crazy Teaching for SBG information. 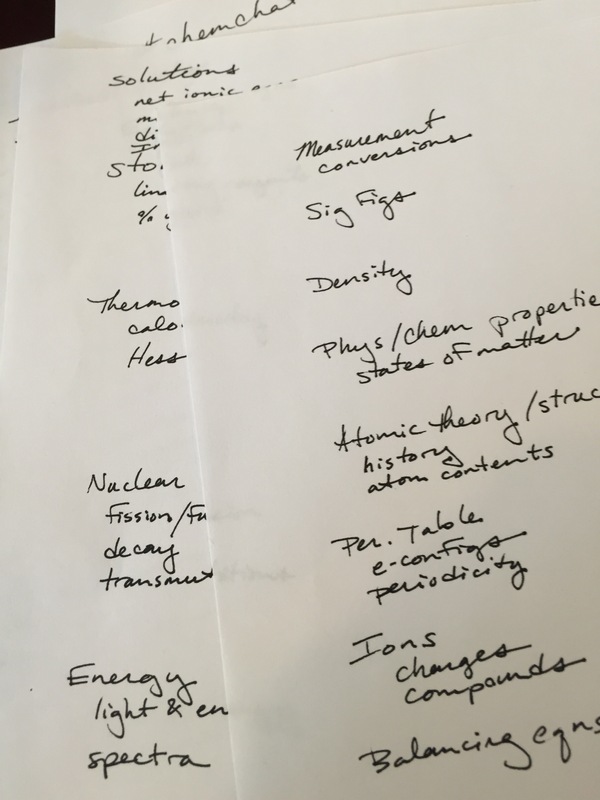 The curriculum works in my head, but it’s been a while since I’ve actually written out plans. My previous school was more of a fly-by-the-seat-of-my-pants kind of place, since each student was on his/her own schedule. I had a list of topics to cover by the end of the year, but the pace, and even the order changed for each kid. I feel like a first-year teacher again. Posted in 180_Regeneration, Curriculua and tagged 180blog, chemistry, curriculum, sbg. Bookmark the permalink.